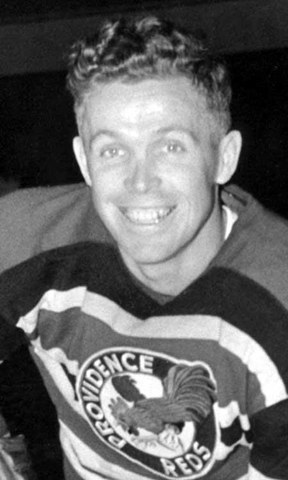 A “Class of 1968” inductee, Harvey Fraser was a member of Providence’s 1948 Calder Cup team. In five seasons with the Reds (1944-1945 and 1946-1950), Fraser tallied 265 points on 113 goals (45 in 1947-48) and 152 assists in 207 games. Harvey skated for the Cleveland Barons on their road to the Calder Cup in 1944. A natural goal scorer, Harvey tallied a career high 45 goals for the Reds in the 1946. The following year, he tallied 55 helpers. In 1949, he helped the Reds capture the Calder Cup. Fraser spent one season in the NHL in 1944, scoring 5 goals and 9 points in 21 games.